Sean Ingle- The Guardian, Monday 9th, December 2013 Champions are less creative this season and have spent six hours behind their opponents already during league campaign. 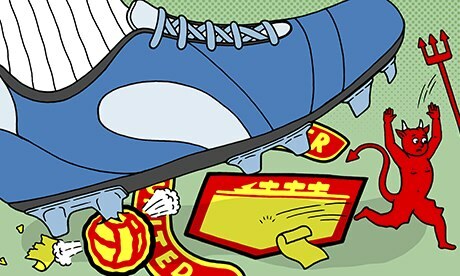 For two decades it was one of English football's immutable laws, as unbendable as granite, as certain as the dawn: Manchester United would always canter to a Champions League spot and challenge for the title. Not since 1990-91, when they finished sixth – 24 points behind the champions, Arsenal – have they dropped so far off the pace this early in the season. Now what was blithely assumed by some younger United fans to be a birthright appears as brittle as old bones. The numbers this season are more in the red than black. Their points tally of 22 is their lowest after 15 matches since 2001-02. They have the same number of league defeats – five – as in the whole of 2012-13. Average goals per game have slumped from 2.26 last season to 1.43. And of the stats Opta track – including possession, cross completion, duels won, shots on target – United are worse this season than last, save for one: they score a higher percentage of goals (36% compared with 31%) from set pieces. The question is: is this just mid‑season turbulence, which can be corrected mid-flight, or is it something more serious? Ted Knutson, the co-editor of the analytics site Statbomb, has few doubts. "This United team won't finish fourth this season," he says. "The underlying numbers say they are too much off the pace." Knutson has been banging this particular drum since October. "Nothing has changed. Last season, United had the highest percentage of shots from the best areas and they gave up the lowest percentage of shots from the best areas. That's not what their shot chart looks like now. They are giving up more shots in dangerous areas, and the chances they are creating are not as good." There are numerous explanations for United's tumble. Some blame the new executive vice chairman Ed Woodward, who was about as successful in the summer sales as a man after a winter coat. Others quite rightly point to the long-term leeching of the Glazers, who have taken £680m out of the club to service their takeover; the failure to sign a single central midfielder between 2007 to when Marouane Fellaini scooted in on deadline day; and the ageing back four. There are also laments for the ones that got away, such as Paul Pogba, as well as the ones who never arrived. All these reasons are valid, but most are not new: we have heard the orchestra play these tunes a thousand times. But while United have suffered injuries to key players such as Robin van Persie and Michael Carrick, the most substantial change has been to the club's conductor. David Moyes took over a squad that finished 11 points clear last season. Given they are so far behind fourth place, it is only right to ask what has altered. First, United are less creative and more direct. They have played a slightly higher percentage of forward passes (41.9% compared with 40.1% in 2012-13) but have less success when they pass the ball into their opponent's final third (54% compared with 57.3%). And while football heat maps too often resemble 1990s Global Hypercolor T-shirts with their catarrhy blotches of stat-gunk, United's has noticeably changed, with fewer red patches in central zones – signalling that they are not playing through teams as much – and greater activity on the flanks, particularly on the left, indicating more crossing and less efficiency in attack. Player tracking data shows that there are fewer runs being made into the box too. United's midfield is an obvious weakness but any side with Wayne Rooney, Van Persie and Shinji Kagawa should be more fluent. At the other end, United are blocking fewer shots (21.8% this season compared with 29.9% in 2012-13), suggesting opponents are having more attacks and shots on the break. In some ways Moyes is a touch unlucky. Last season United didn't dominate as much as the final Premier League table suggests. In only 50% of games did they have more shots on target and possession than their opponents, and they came from behind nine times to win. It was will, as much as skill, that earned them their 20th league title. United are finding it harder to break down teams. Already this season they have been behind in league matches for a total of 358 minutes. In 2012-13 it was 416 minutes across 38 games. Losing a goal was usually a signal for Ferguson's sides to unleash sound and fury; too often Moyes's United have gone mute. Taking over from Ferguson was always going to be a staggering challenge, the football equivalent of climbing the Eiger. Before the season started, John Goddard, a professor of financial economics at Bangor University, examined every managerial spell in English football for nearly 50 years to assess how much a side dropped off when great managers – including Don Revie at Leeds and Bill Shankly at Liverpool – departed. Goddard's forecast was that if Moyes performed at the average level of such successors United would finish the season with 73 points. Even that looks like a stretch now. Then again, United's next four games – against Aston Villa, West Ham, Norwich and Hull – look winnable but that was said about Everton and Newcastle, too. Moyes insists that United can still win the league but the real battle now is surely for the final Champions League spot.